One of my favorite New Testament stories is the one that begins with Jesus asleep in the back of a small boat he and the disciples were using and suddenly a storm nearly destroyed the boat which would have been disastrous for Jesus and the disciples. I am sure you’re familiar with it as well. If you are then you know that after the disciples woke Jesus he rebuked the storm and the sea became calm. It is one of my favorite stories because to me it isn’t just a story I live it out every day in my life. It would be great if being a faithful follower of Jesus came with a storm free life. We know that isn’t going to happen until God takes us home don’t we? We know God does not protect us from storms but what we do know is God protects us IN the storms. 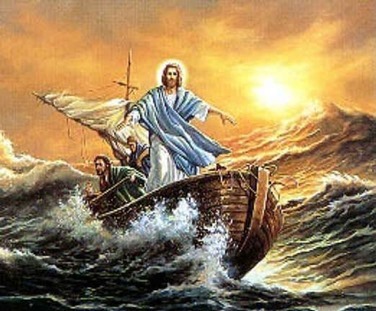 When Jesus stood up in the boat that night long ago he silenced 13 storms, he brought not only peace to the sea but also to 12 terrified men as well. The other day as my Pulmonary Doctor told me my lung capacity has diminished significantly I immediately found myself surrounded by an emotional storm. Yet almost instantly I began feeling the familiar touch of Jesus’ peace as the Holy Spirit stilled my inner storm. Storms will always be a significant part of our lives but within the center of every storm is the One who can still every storm.